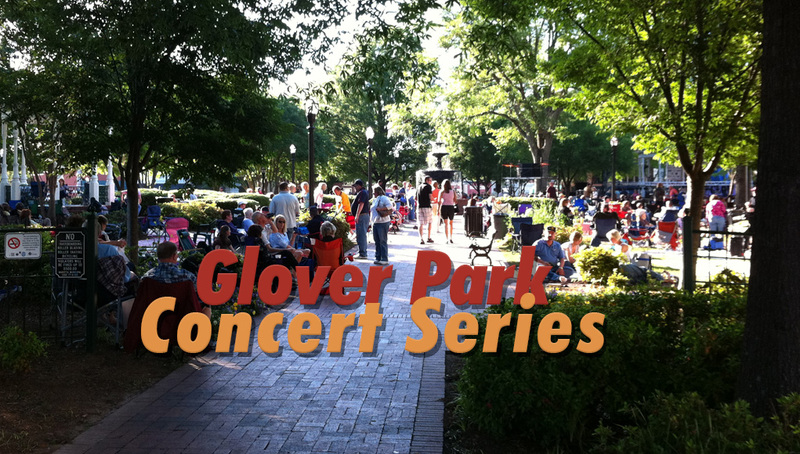 The 2019 Glover Park Concert Series takes place on the last Friday evening of each month from April to September. Enjoy music under the stars and be sure to bring a picnic and blankets or set up your lawn chairs after 4 pm (no tarps or tents). 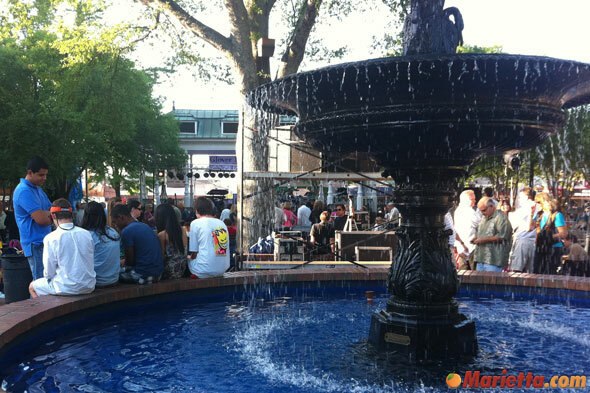 Personal tables can be set up in the street on North Park Square after 5:30 pm but not in Glover Park. The free outdoor concerts take place at 8 pm. 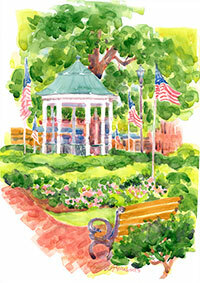 Painting of Glover Park, featured on the poster for the 2009 Glover Park Concert Series, by Marietta resident and artist Coë Steinwart. All concerts are free all summer long, but if you’re looking for a front-row seat, a limited number of tables can be reserved for a fee. For more information about table reservations, call (770) 794-5601. Reservations for tables are on a first come basis beginning on the first working day of each month at 8 am. For more information, call (770) 794-5601. Hi Gail, thanks for the comment. 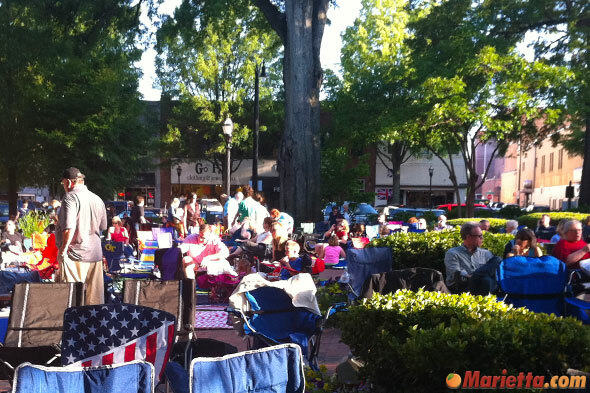 Hopefully the next two Marietta square concerts will be just as good. If you make it to either of them, be sure to stop back by and let us know what you thought. Does Mariett sponsor Movies in the park. We are not aware of any upcoming Movies in Glover Park, however movies are sometimes shown at The Strand Theatre next to the park in Marietta Square. There are also outdoor Movies in the park at Laurel Park and East Cobb Park. Check out the Marietta.com calendar of events for more information regarding upcoming showtimes. I loved your 2009 concert series and am looking forward to 2010. Am interested in when the calendar will be ready. Who’s playing the first concert 4/23? When is the upcoming band list going to be posted? Marietta Parks & Recreation, Carolyn Morris and Maggie May — Thanks for the opportunity to come again and “party” with the stellar group of music enthusiasts from Marietta. This is our third or fourth concert there, and each one seems to be more fun to the last. Special thanks to Maggie for her kind help and attention. I told you, as Marvin Gaye said in his song “You’re A Wonderful One”!! To all the people in attendance who DIDN’T know the Soul Purpose Band before last night. We’ve already received 100s of verbal compliments and rave reviews, and a few are coming in by our website. You guys ROCK!!! 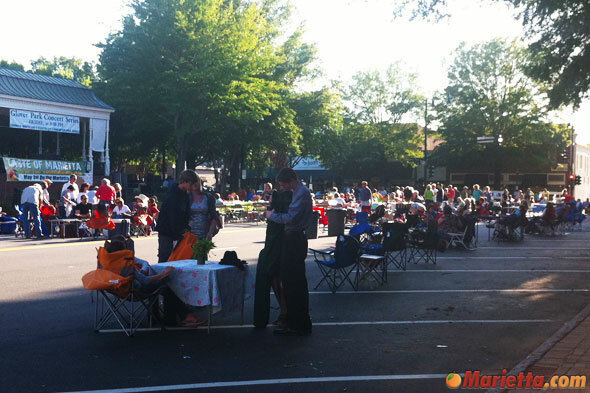 WE LOVE THE MARIETTA CONCERTS AND THE PEOPLE WHO ATTEND. We’re looking forward to the next opportunity to come and be with you all. We wish you all Peace, and the BEST of God’s blessings until we see you again. Several hundred of us enjoyed The Soul Purpose Band tonight in Glover Park on Historic Marietta Square. The vocals, the horns(!!) & the playlist were wonderful, & a great time was had by all. We’re looking for an opportunity to enjoy another evening with The Soul Purpose Band! 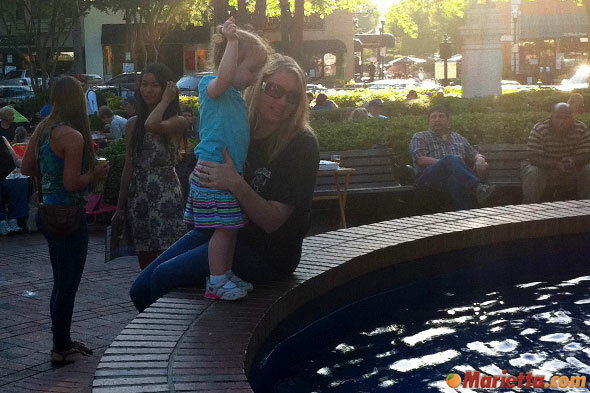 My wife, our friends and the other people we met there had a great time Friday night @ Marietta Square. The Soul Purpose Band was awesome!!! The friendliness of the poice dept; the staff, the overall concert atmosphere last Friday night was AWESOME!!! Please have The Soul Purpose Band back!!!!! My family and friends loved the concert on June 25,2010. The atmosphere was great out in the park on a Friday night. The Soul Purpose Band was EXCELLENT and I would love to hear more from them, so please, please have them back for many more concerts!!! The Soul Purpose BAnd on 6/26 was awesome! I have seen them perform before and I can never get enough of them. Yvette Kleckley, the lead singer should be a star. She is so talented. The band is just the best…..just waiting for them to drop a cd. Please have them at Glover Park again. I will definitely be there with many of my family and friends. Is it still on for tonight or cancelled due to weather? We are not there but it looks like it is still on. Let’s hope the rain stays away for just a bit longer. How late do the concerts typically run? Love to make it out when my husband gets off work.. I noticed the comment above from Gail on August 4, 2009 about The Grapevine Band. I know others who attended this concert and loved them also. I didn’t know about The Grapevine or the concert series in Glover Park in 2009, but have since been to several Grapevine Band events. I agree with Gail…they are amazing! What would be the chances of having them in the summer series again soon? I know many woould enjoy them and they would be such a hit! Please invite them back. I would love to see them locally instead of having to travel to other events in other cities to see them. I know there are great concerts every summer in the park, but these guys would be great to have again. Please respond. When will Glover Park Concert Series 2013 line up be announced?? Would really me nice if you listed the concert park line up! As soon as the city finalizes the lineup and announces it, we will add that information to this article. I would like to see the Jagged Stones play a summer concert series. They are fantastic. They played the Strand on New Years Eve. A1A on the 23rd. The Marietta calendar says that A1A will be Glover park Friday the 23rd – buuut – it’s not the last friday of the month, the 30th is. So, when are they actually going to be performing? Thanks for the question. They will be performing on August 23, 2013. It is usually the last Friday of the month, but there were two exceptions this year – the GSO Jazz in June and this one. Hope you can make it. Who is the concert band for April? Please look at the Mike Veal Band for future concerts. They are a fantastic band and they are from the ATL! They play all types of music and you won’t be disappointed! How about The Tams for 2015? Great Atlanta-based institution. 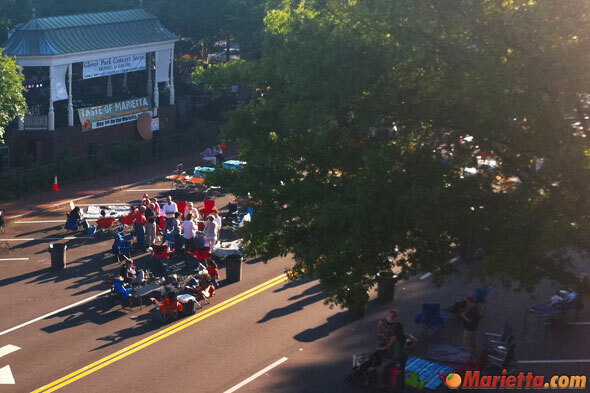 When is the band “The Fabulous Expressions” coming back to the Marietta Square? This is the best band we have heard at the Square. We also have seen them several times in Panama City Beach. Are dogs allowed at the concerts? Yes Dogs are allowed. We’ve taken ours several times. Thanks john good to know. Hi, I’m competing in Miss Georgia in June and I needed a venue to practice performing my talent, singing. 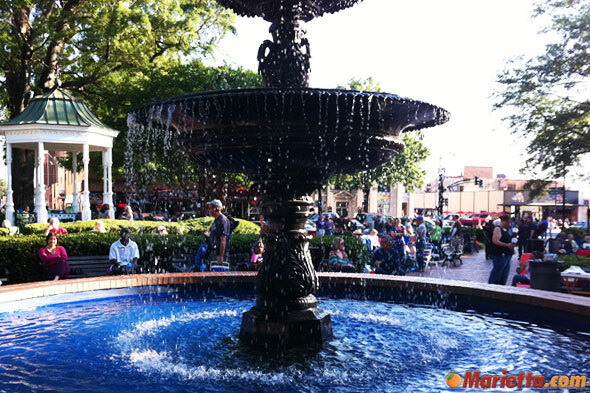 I’m a resident of Cobb county and attend many events at the Marietta Square. I wanted to ask if I could have an opportunity to perform my song on stage? It doesn’t have to be an official performance, maybe even while you all are setting up or in between acts. Thank you! We saw the Mike Veal Band at the July concert on the Square and they were great. They played so many great songs and never took a break the whole night. My friends and I danced nearly every song. We couldn’t sit still! They seemed to really enjoy the enthusiastic Marietta crowd that packed the streets and Glover Park. We had a blast and I’m pretty sure they did too! Any idea when the 2016 concert in the park schedule will be coming out?? Haven’t yet been to a concert, but planning to soon with a group of friends. A band you should check into that are AMAZING is the Glow band. WHY RENT A TABLE WHEN YOU CAN JUST ROPE OFF AN AREA OR LAY TARPS DOWN TO RESERVE SPOTS. WOODSTOCK DOES NOT ALLOW THIS AND IN ALL FAIRNES IT SHOULD NOT BE ALLOWED IN GLOVER PARK. 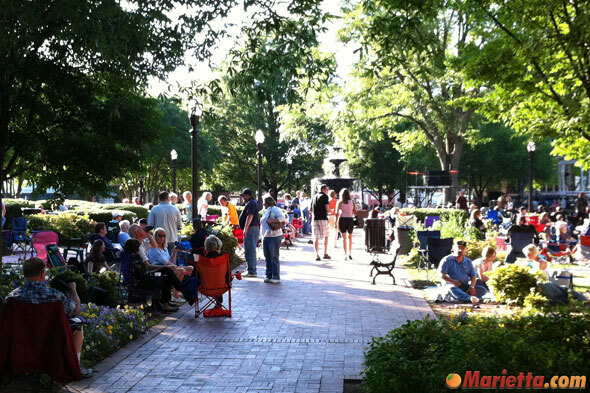 Love the Marietta Square concerts. Disappointed Last nite when I arrived at 6pm to find our usual spot covered with several tarps saving a huge area for over 50 people. Is this allowed? This was on the closed street near the children’s play area with the small train. Most of the 50 did not arrive until about 7:30pm. I had four different people trying today to reserve a table for this month’s concert at the square. We were all unable to, despite trying at 8:00a.m. sharp. Was there a problem with the reservation system?